Merry Christmas everyone! 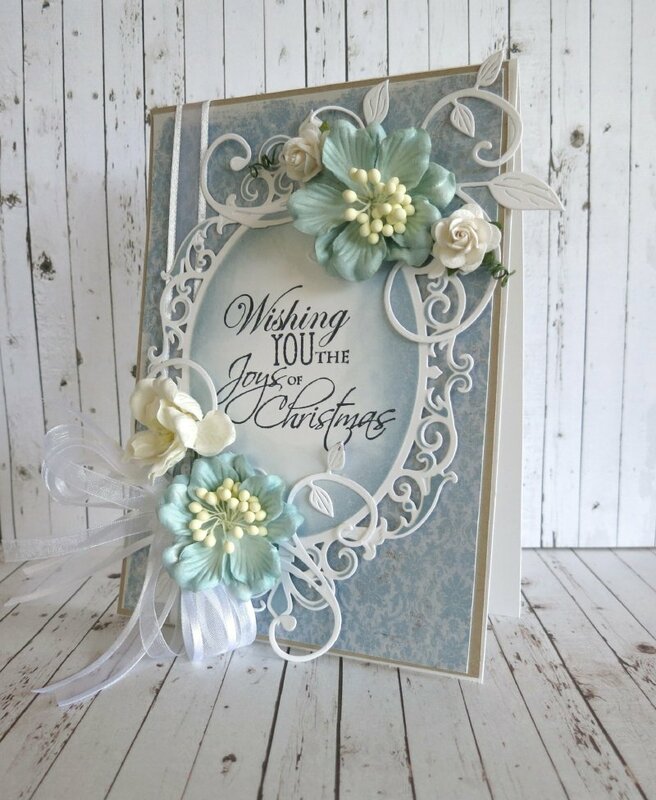 This is my final card that I will be sharing with you as a Creative Team member of Maja Design. It has been a dream come true being able to create with the wonderful collections this year and I certainly will continue to do so in the the following months. I hope that today you are enjoying the time with your family and friends and that Santa has been kind to you! 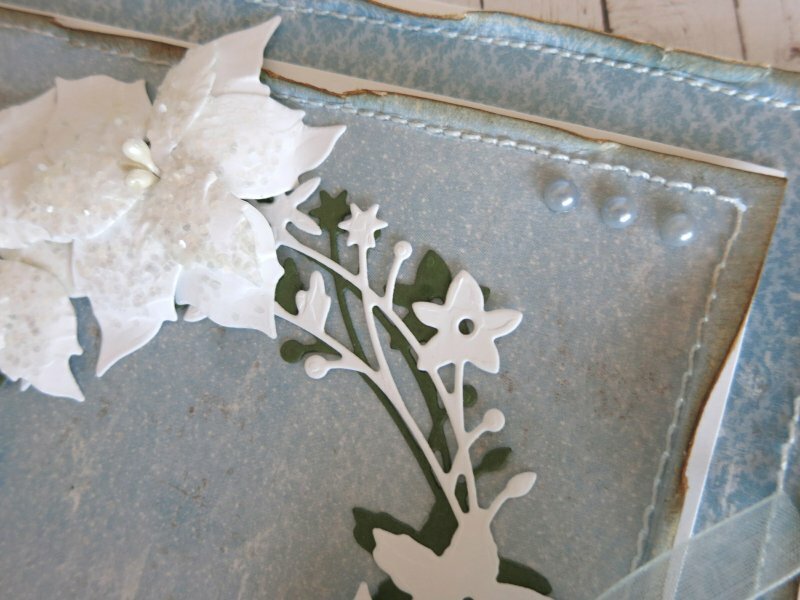 I die cut Spellbinders Fleur de Elelgance and while the paper was still in the die, used a distress ink applicator and sponged weathered wood distress ink. I selected the sentiment from a Kaisercraft St Nicholas clear stamp and used my MISTI stamping tool to position and stamp it onto my die cut. 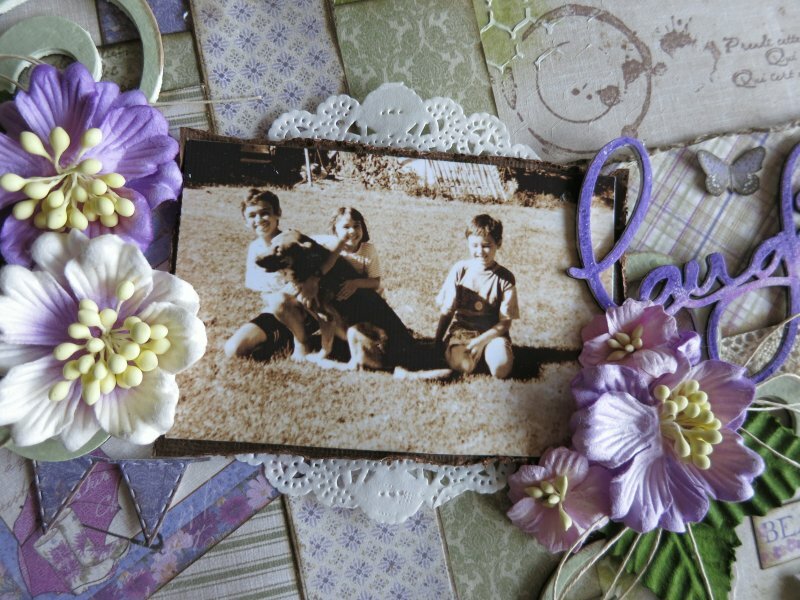 To form this cluster, I used a Cheery Lynn fanciful flourish die and used a Green Tara azalea and some Wild Orchid Crafts roses. To add fullness to my bows, I used two widths of rayon ribbon on my peg bow maker. 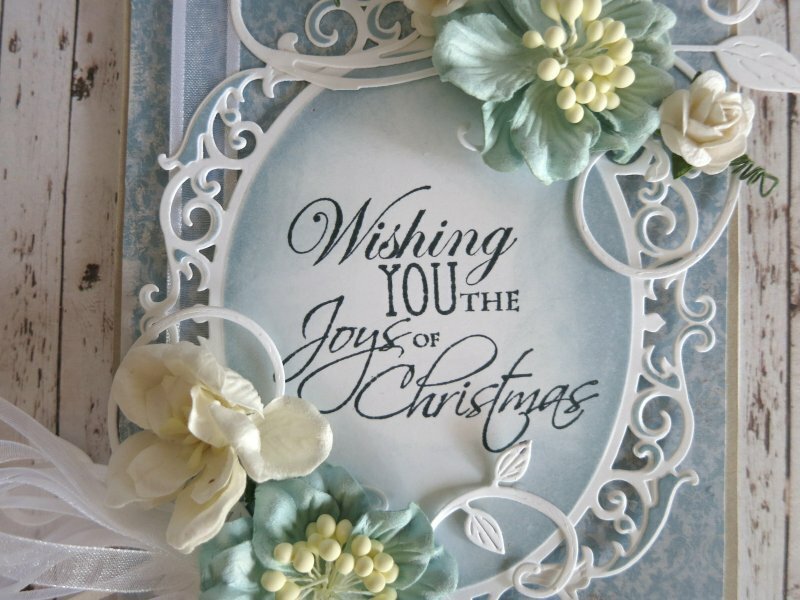 As my card reads, I do wish you the joy of Christmas and a safe and prosperous new year. I would also like to thank Marie, Camilla and Jenny for the wonderful opportunity of being part one of the Maja girls this year. I have loved every moment. Hello everyone! I cannot believe how quickly the time is passing. The month is nearly and over and my year at school is nearly over as well (I’m doing a happy dance atm). It feels strange creating a wintery Christmas card to share with you as Christmas in Australia is simply the opposite…as we celebrate Christmas in summer! However I couldn’t resist the wonderful images in the beautiful collection Home For the Holidays. I love the blue tones of the papers. 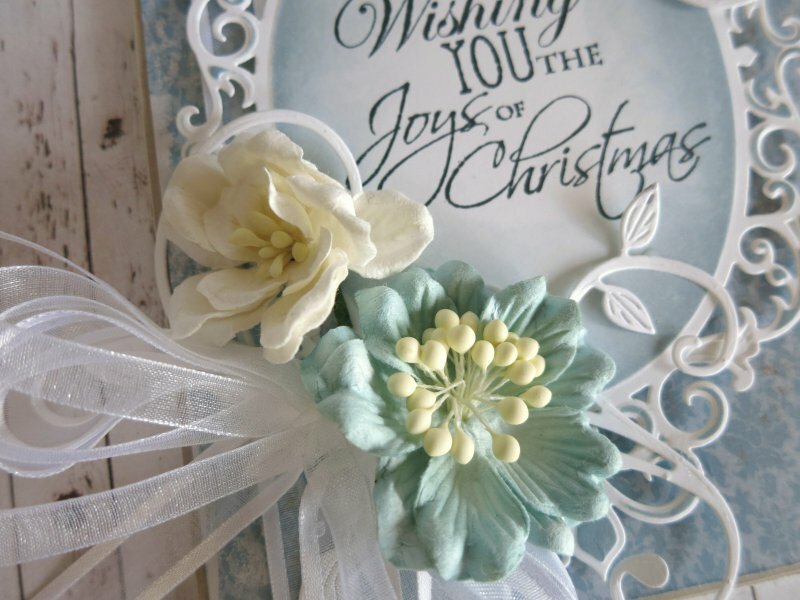 I created my own poinsettias using Magnolia Christmas Poinsettia dies. I applied some Ruby Rock-It Snow White Course Glitter on top of them to add some shimmer. 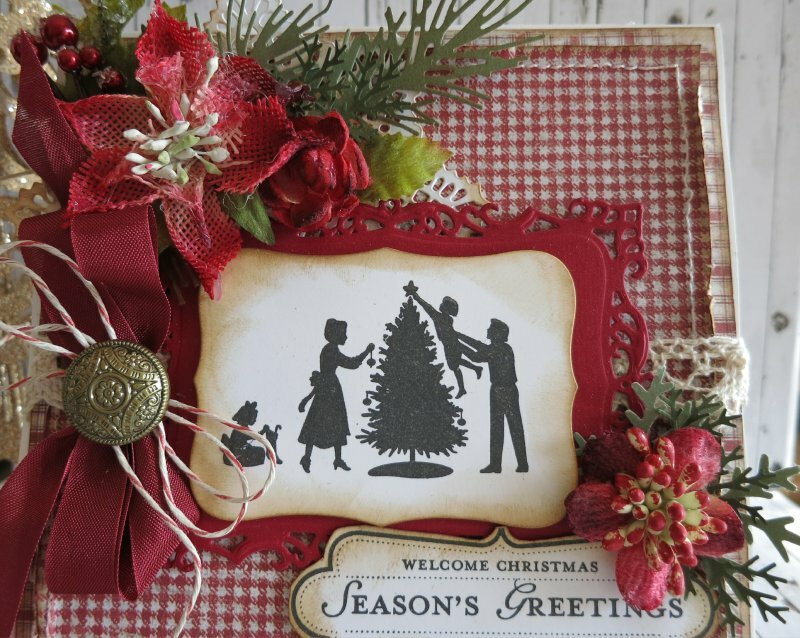 The foliage is die cut using Tim Holtz Holiday Greens and the tag is also from the Tim Holtz Tag Collection. I incorporated my sentiment here as well which is from JustRite. I used a Memory Box Catalina Wreath and die cut it twice. By placing it slightly off centre, it created a lovely shadow effect. I am slowly creating my Christmas cards…I haven’t made a dent into my intended target but once school finishes and all my deadlines are met I can really get stuck in and get creating. I have ideas but sadly only 24 hours in a day (sigh). Anyway, thanks so much for stopping by today and I hope to have more to share with you soon. Hello everyone! I hope that you are all well. Today I would like to share a layout that I have completed using the latest collection from Maja Design…Enjoying Outdoors. I took this opportunity to create another page for my brother’s album that I have been working on. This photo is of my siblings many years ago with one of the dogs we had growing up. The photo dictated my title. I used a Blue Fern title and applied two coats of gesso. Then I used some Gelatos and rubbed it in with my fingers to create the ombre effect. It was so easy to achieve! Every part of the papers has potential. The title strips formed my journalling. I also used some left overs to create some banners as shown. 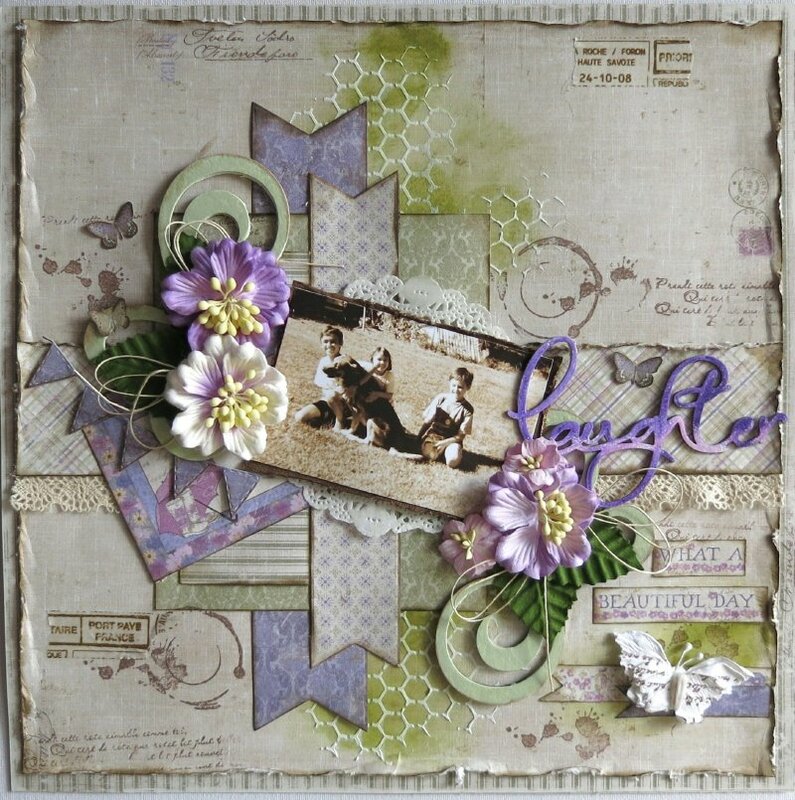 The butterfly was stamped using a script stamp from Bobunny to give it a vintage look. The collection has so many beautiful greens and purples. I selected approx three papers and inked the edges using walnut stain distress ink. I selected a dark, a medium and a light in terms of pattern so that they wouldn’t compete too much with each other. As it is the outdoor, I used peeled paint distress ink as part of my background and the applied TCW chicken wire reversed stencil on top. I also did some stamping and added some random pieces of printed tape in places. I can never get enough of flowers! I have used some Green Tara flowers here. These are called azaleas and I love that they are not too bulky but have enough dimension and also compliment the papers perfectly! Hello everyone! Today I have another Christmas card to share with you. I really am committed to my self imposed target of creating enough Christmas cards for my family and friends. Two down and ….to go! (not sure how many but it always increases each year I am sure!) 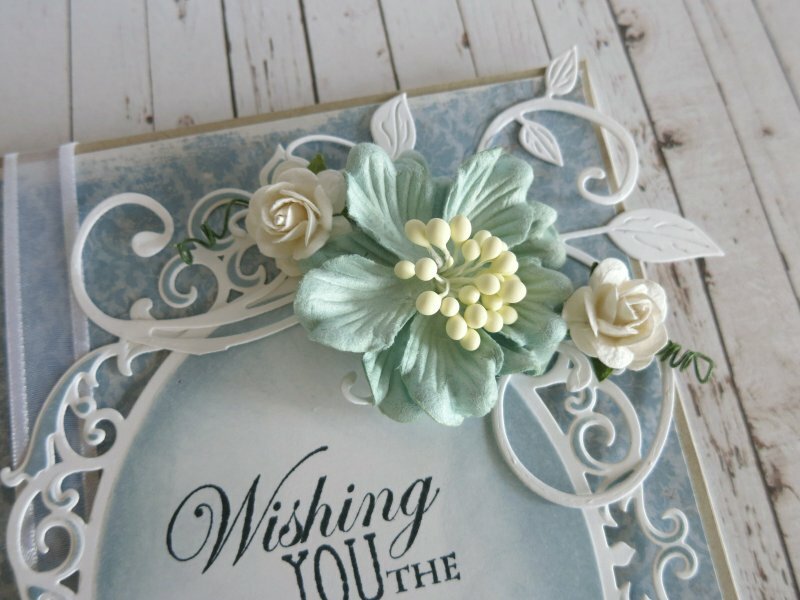 I am really loving the A Gift For You Collection from Maja Design. 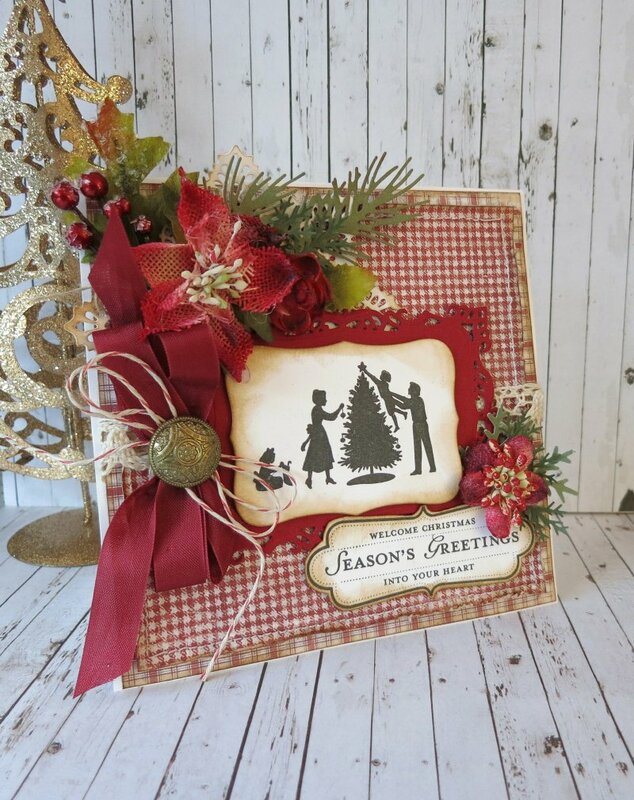 The rich tones remind me so much of Christmas! Over the years, I have collected a number of stamps and I love have the opportunity to use them. This stamp set from Stampin;’ Up! is a favourite of mine. 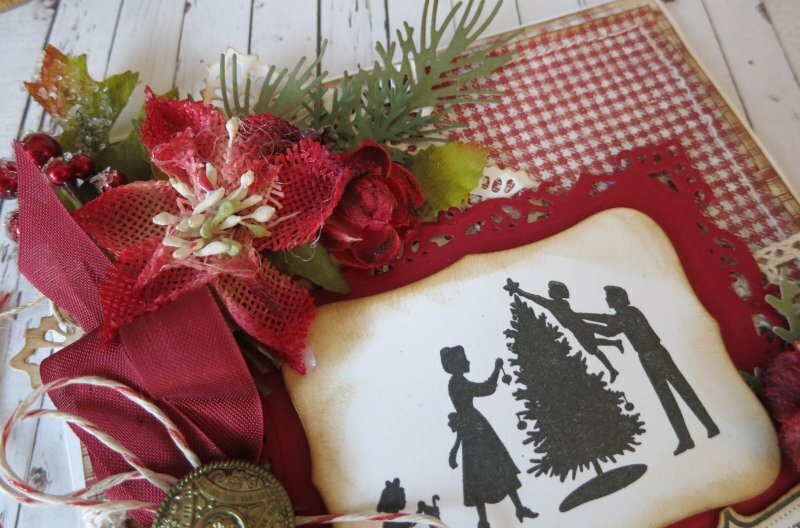 I love the feeling it evokes…the excitement of decorating the Christmas tree. I have used Petaloo flowers and clusters here. 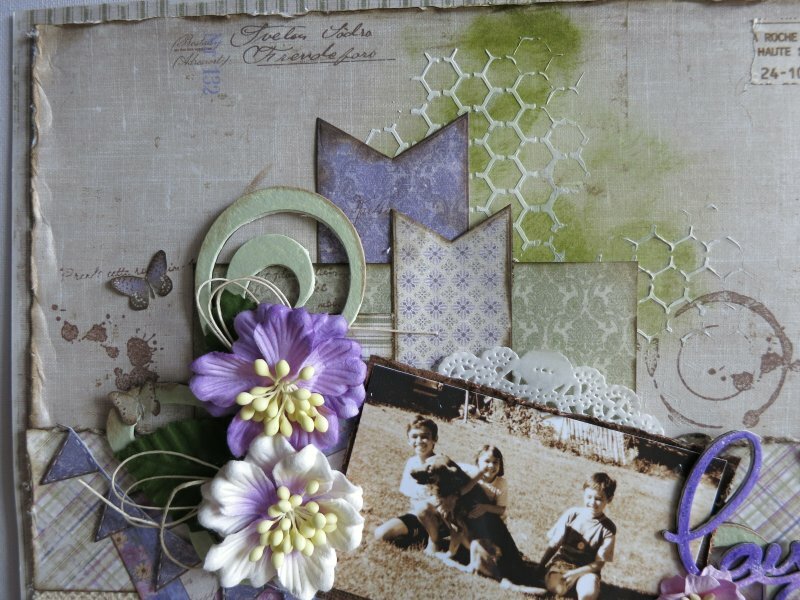 They coordinate beautifully with the rich tones of the Maja papers. 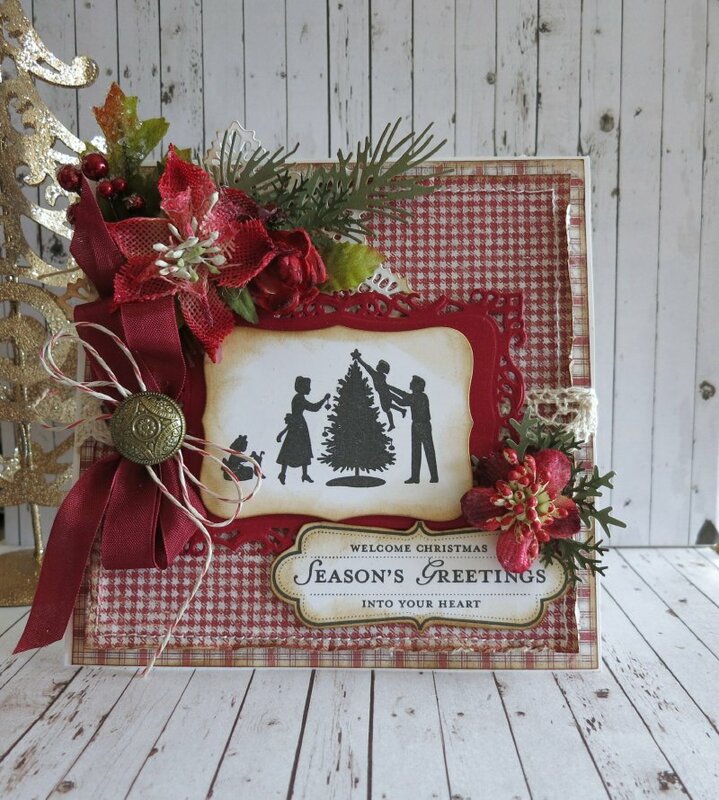 I have also added some foliage using a Sullivans and Martha Stewart branch punch. 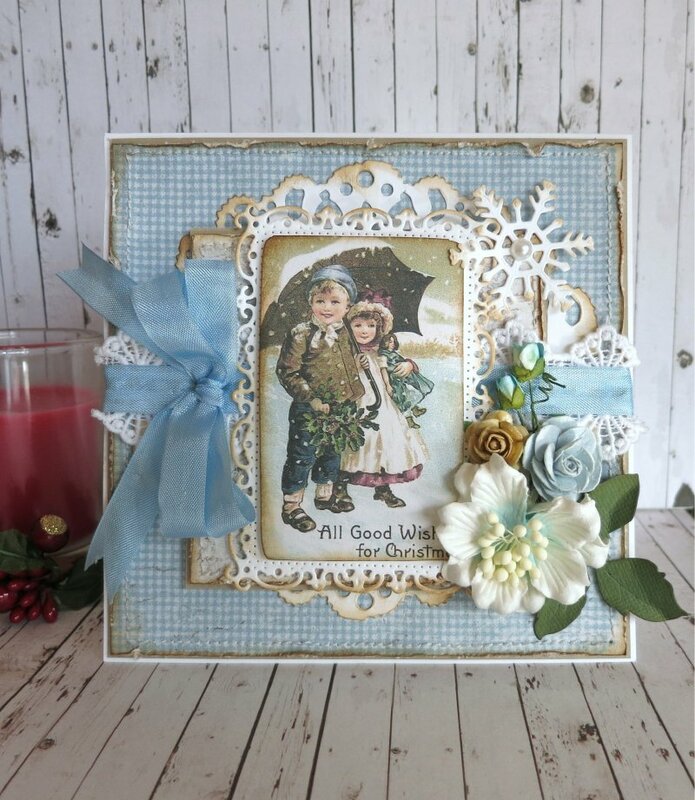 To complete my card I have added other vintage elements such as lace, seam binding and a vintage button…things from my stash. I wish you well in your efforts to create your Christmas cards. 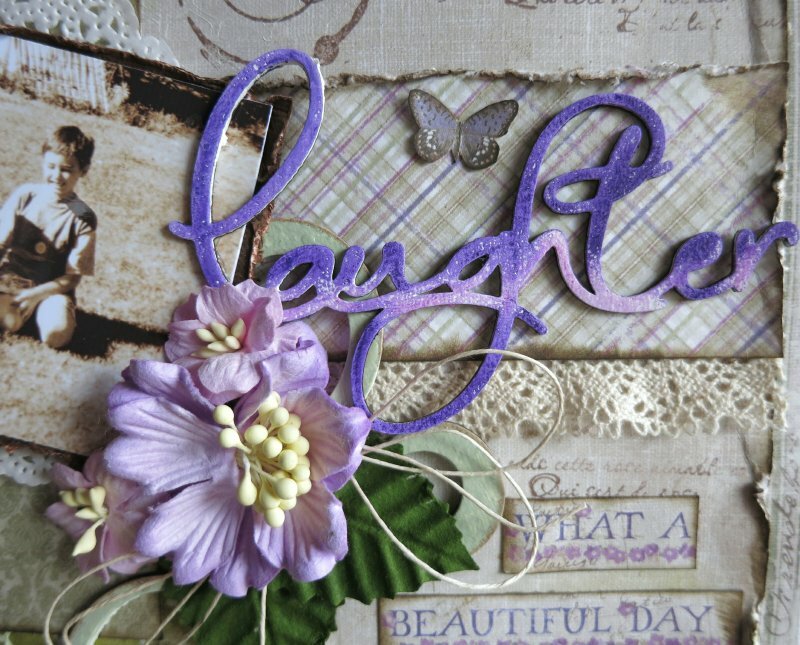 Perhaps you can share some advice or even upload your creations onto the Maja Design Facebook page. Hello everyone! I can’t believe how quickly the time is passing. 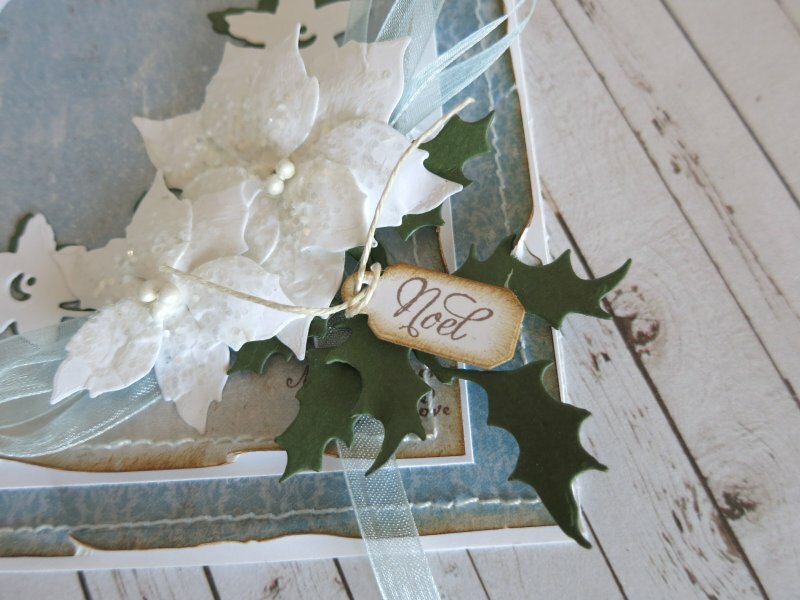 Today I am sharing my first Christmas card of the year and I know that it is just around the corner. Being a card maker, I never seem to have enough handmade Christmas cards for my family and friends made within a reasonable time frame, so this year I am determined to have enough made! 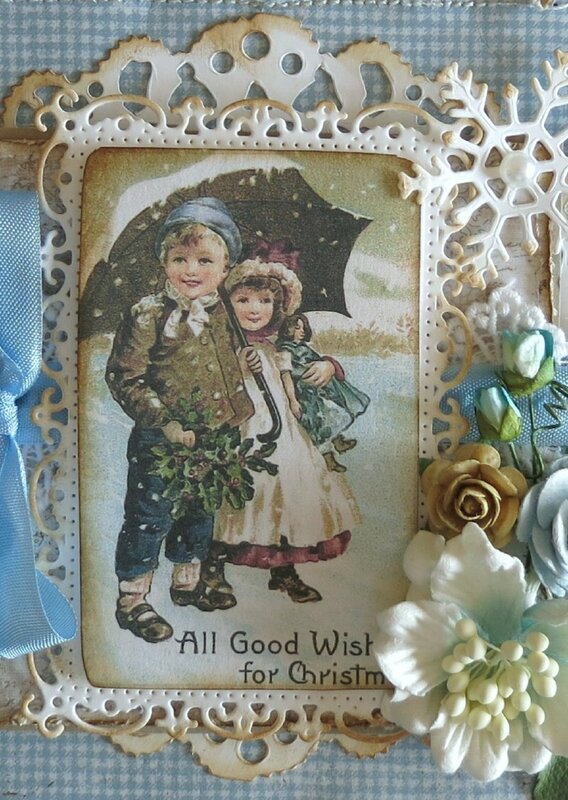 I love the trimmings and decorations of the Christmas season and one thing I especially love are vintage Christmas cards. 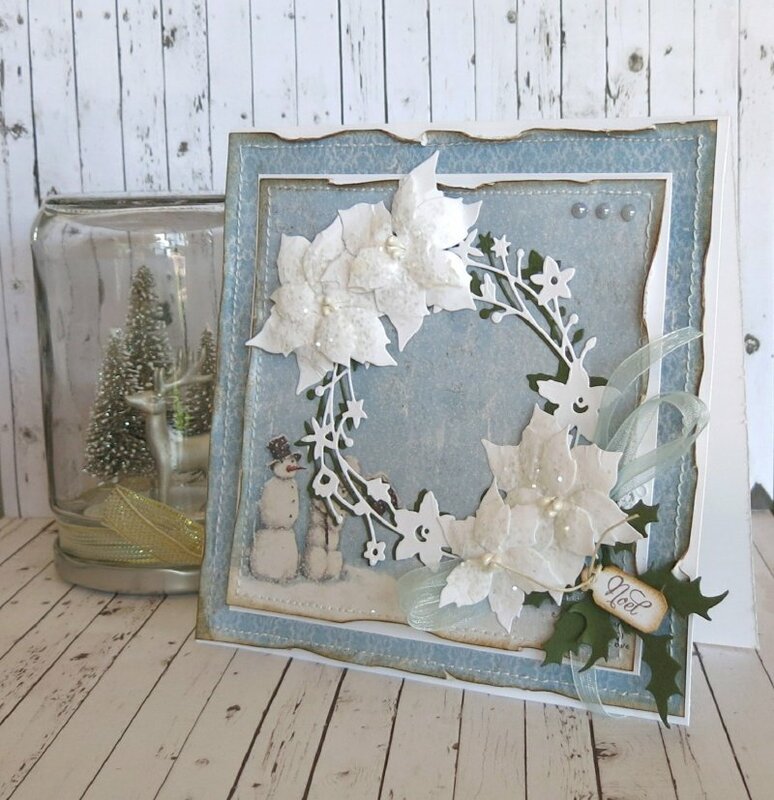 I absolutely love all of the vintage images that are in the die cut sheet of the Vintage Frost Basics. 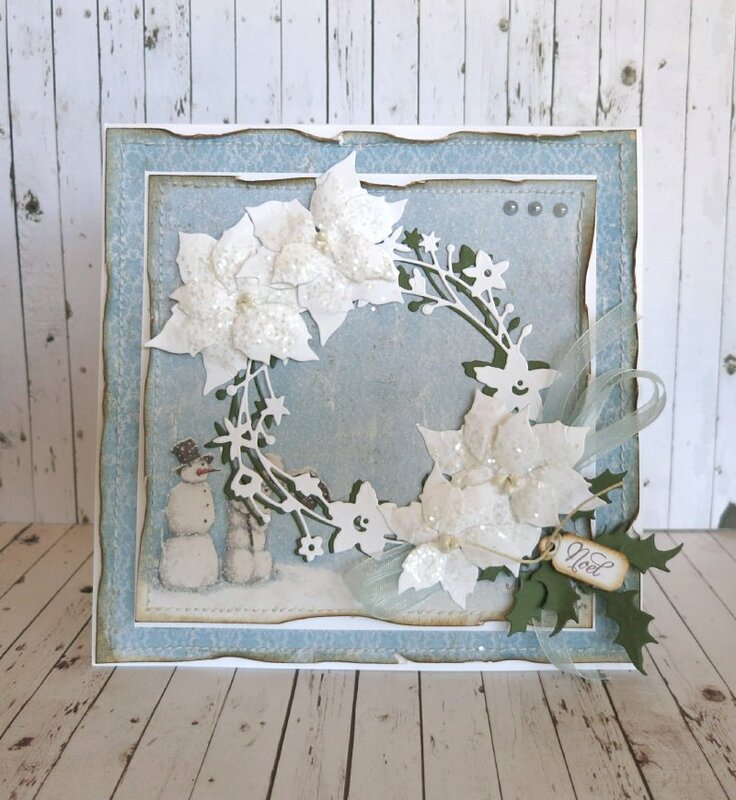 I layered this image with Spellbinders Timeless rectangles, then layered it on top of 10th December and tucked in Tim Holtz on the edge Distressed doily die. 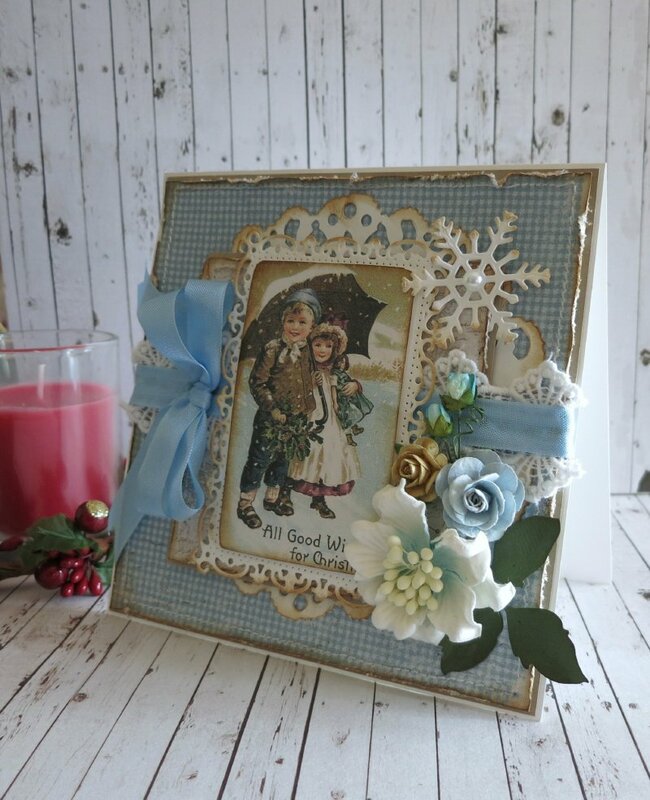 Everything was distressed with Vintage Photo distress ink. 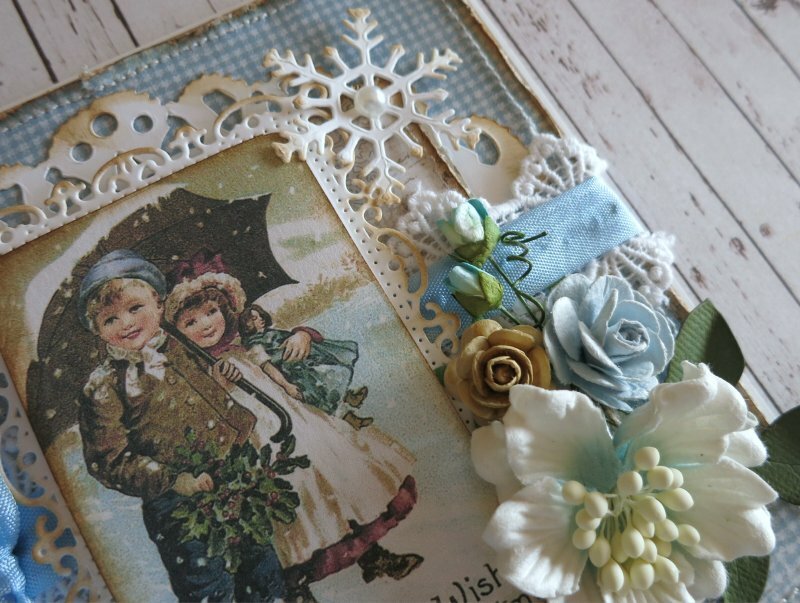 To create some vintage touches, I used lace and seam binding. 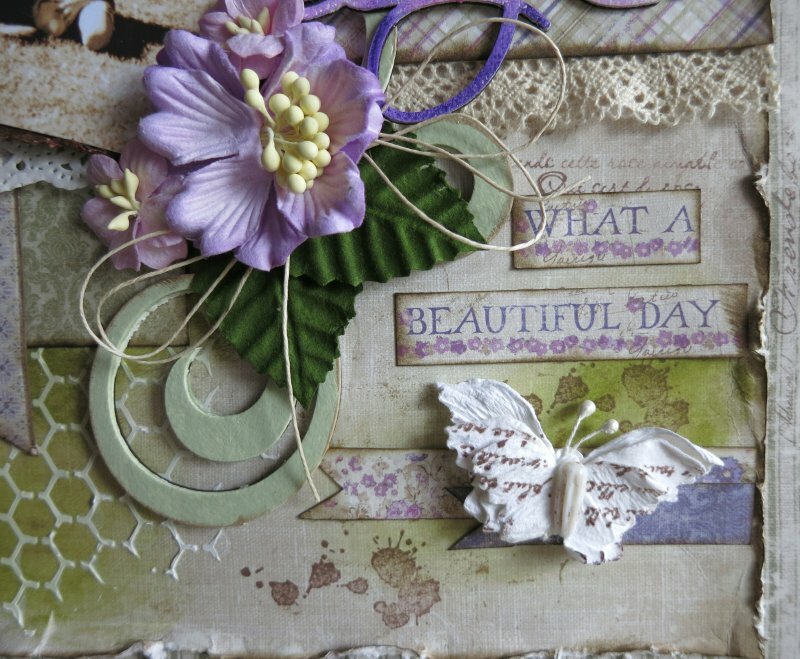 I used a variety of flowers from Green Tara that had muted tones, that compliment the papers. 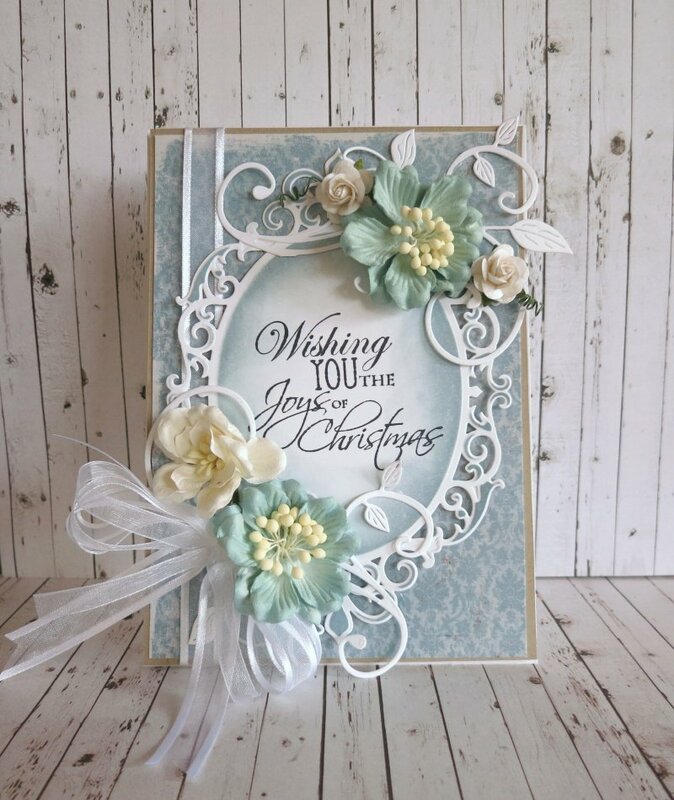 The Vintage Frost Basics Collection has so many beautiful papers and die cuts to work with. I especially love the blue tones (there is pink in this collection as well!) I look forward in creating many more cards for my family using these papers.